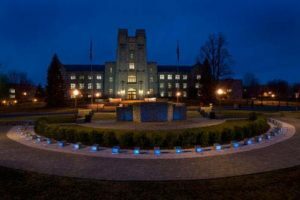 ****On April 16, 2007, a student at Virginia Tech with a history mental illness broke into a dorm killing 2 students. While police were responding that that emergency, he left the dorm, changed his clothes, mailed a package to NBC before walking back across campus. Two hours after the first shooting, he entered Norris Hall, chaining the doors shut behind him. It was there that he killed 5 professors and 25 more students, injuring dozens more, before committing suicide. The massacre is one of the deadliest shooting incidents by a single gunman in U.S. history and one of the deadliest by a single gunman worldwide. The 32 double unders is for the number of Hokies shot that day.